ASHEVILLE, N.C., Aug. 24, 2011 (SEND2PRESS NEWSWIRE) — Sunday, August 21, 2011 marked the sixth anniversary of Bob Moog’s passing and the fifth anniversary of the Bob Moog Foundation’s formal launch. In celebration of that milestone, the Foundation is making daily announcements of new projects, branding and fundraising opportunities. Monday, August 22 saw the launch of the Moogstress blog, written by Michelle Moog-Koussa. 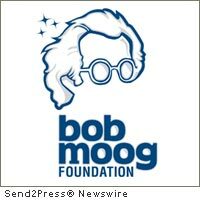 On Tuesday, the Bob Moog Foundation (BMF) announced their new logo, which features the innovative spirit of “Dr. Bob” and an offer for a limited edition poster designed with materials from Bob Moog’s archives. Later in the week the BMF will release a new merchandise line, “Dr. Bob’s Archive Series,” featuring artwork found in Bob Moog’s extensive archives. The BMF directs the preservation and interpretation of the archives for future generations of journalists, educators, innovators and fans. As part of the anniversary events, synthesizer and vocal sensation Tara Busch has donated a three song EP to support its mission of “igniting the innovator inside us all.” The ethereal electronica EP, “Rocket Wife,” created specifically for and donated to the Bob Moog Foundation, is available for download at Bandcamp at the following link: http://bobmoogfoundation.bandcamp.com/album/the-rocket-wife-ep-by-tara-busch . The remix contest begins August 24, 2011 and ends at midnight on October 15, 2011. All submissions should be uploaded to the “Rocket Wife” group on SoundCloud via this link: http://soundcloud.com/groups/rocket-wife-remix-contest-tara-busch-and-the-bob-moog-foundation . The Bob Moog Foundation will announce three winners on November 10, 2011. Three winners will have their remix posted on the BMF Bandcamp site where it will be available for sale, with proceeds benefiting the Foundation. The grand prize winner will receive a framed limited-edition archival image of Bob Moog, a selection of BMF merchandise, and the opportunity to collaborate virtually with Busch on a track where she will supply vocals and synth soundscapes. Tara Busch is an American producer/musician/remixer and score composer. She is influenced by the rich, complex harmonies of Brian Wilson, BBC Radiophonic Workshop diva Dellia Derbyshire, and the innovations and futurist attitudes of electronic music pioneer Bob Moog. She is known for her richly textured, vocally orchestral electronica, and her psychedelic, ethereal remixes. * Dr. Bob’s Sound School (formerly MoogLab) teaching children and adults science through music in a hands-on environment ( http://www.moogfoundation.org/2011/notes-from-the-soundschool ). * Dr. Bob’s Archive Preservation Initiative. The BMF directs the preservation and interpretation of Bob Moog’s extensive and historic archives for future generation. * The Moogseum, a future interactive facility where music, science, history and innovation will converge. The creation of the Moogseum is pending adequate funding. Original Keywords: Tara Busch, Michelle Moog-Koussa, Bob Moog Foundation, anniversary, remix contest, clothing, electronic music, synthesizer pioneer, Robert Moog, minimoog, EP, branding, Moogstress blog, Dr. Bob’s Archive Series, North Carolina non-profit, Sound School, Moogseum, Rocket Wife The Bob Moog Foundation Asheville North Carolina ASHEVILLE, N.C.
REFERENCES: Asheville Business News, Tara Busch, Michelle Moog-Koussa, Bob Moog Foundation, anniversary, remix contest, clothing, electronic music, synthesizer pioneer, Robert Moog, minimoog, EP, branding, Moogstress blog, Dr. Bob's Archive Series, North Carolina non-profit, Sound School, Moogseum, Rocket Wife The Bob Moog Foundation Asheville North Carolina ASHEVILLE, N.C.